The Country/Economy Profiles section presents a profile for each of the 139 economies covered in The Global Information Technology Report 2016. Each profile summarizes an economy’s performance in the various dimensions of the Networked Readiness Index (NRI). The first section of the profile presents the economy’s performance in the overall NRI, the four main components, and the 10 pillars. For each of these dimensions, the economy’s rank (out of 139 economies) and score (on a 1-to-7 scale) are reported. 2. On the radar chart to the right of the table, a blue line plots the economy’s score on each of the 10 pillars. The gray line represents the average score of all economies in the income group to which the economy under review belongs. The country classification by income group is defined by the World Bank and reflects the situation as of July 2015. Note that the two high-income groups in this classification, High income: OECD and High income: non-OECD, were merged into a single group for the purpose of the analysis. This section presents an economy’s performance in each of the 53 indicators composing the NRI. The indicators are organized by pillar. The numbering of the variables matches that of the data tables in the next section of the Report, which provides descriptions, rankings, and scores for all the indicators. The indicators derived from the 2014 and 2015 editions of the World Economic Forum’s Executive Opinion Survey are identified by an asterisk (*). These indicators are always measured on a 1-to-7 scale (where 1 and 7 correspond to the worst and best possible outcomes, respectively). 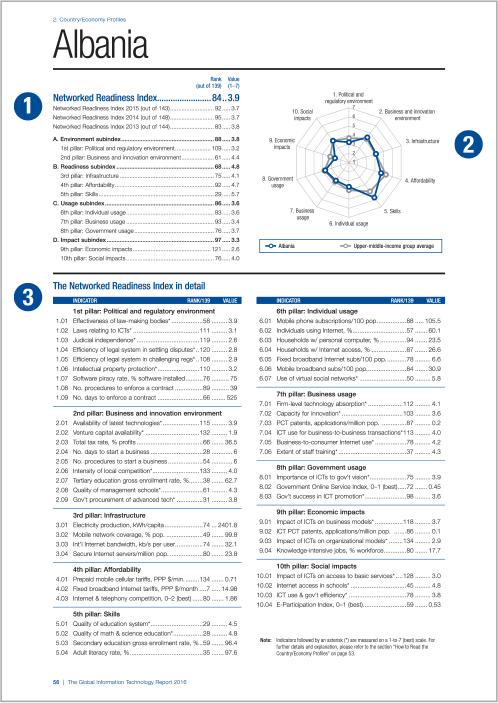 For more information on the Executive Opinion Survey and a detailed explanation of how scores are computed, refer to Chapter 1.3 of The Global Competitiveness Report 2015–2016, available for free on the World Economic Forum website at www.weforum.org/gcr. For those indicators not derived from the Executive Opinion Survey, the scale is reported next to the title. The Technical Notes and Sources at the end of this Report provide further details on each indicator, including its definition, method of computation, and sources. Note that for the sake of readability, the years were omitted. However, the year of each data point is indicated in the corresponding data table. For more information on the framework and computation of the NRI, refer to Chapter 1.1. In complement to the analysis presented in this Report, the GITR’s portal—available at www.weforum.org/gitr—offers additional analysis and a number of analytical tools and visualizations, including sortable rankings and maps. The portal also offers the option of downloading portions of the NRI dataset.